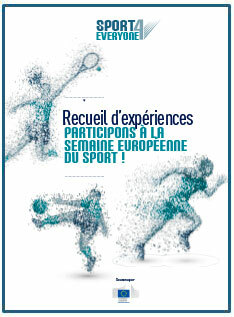 Join in with European Week of Sport! Since July 2015, the “Sport for Everyone” project team has been working on a Handbook on European Week of Sport (EWoS). This Erasmus + co-funded project - gathering 5 National Olympic Committees, NOC, (France, Italy, Lithuania, Republic of Macedonia and Portugal) and the think tank Sport and Citizenship - aims to increase the participation in EWoS and therefore to raise awareness among EU citizens on the benefits of sport. 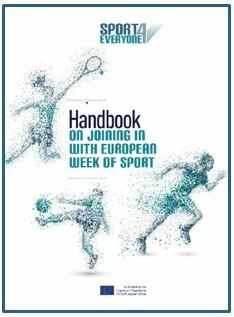 This Handbook on joining in with European Week of Sport provides sport movement and more especially NOC with tangible ideas and tools to implement their own action in this framework. The latter is composed of two main elements: innovative initiatives and a practical guide. A total of 12 initiatives for the 4 Focus Days (named Workplace, Education, Outdoor, Fitness centres) were thoroughly selected. It includes a large panel of projects implemented in Europe: organisation of sport events or challenges, conception of awareness campaign and of training sessions on specific topics. The practical guide, called 8 steps to taking part in EWoS, describes how to create a project during this Week of Sport. From conception to completion, relevant and easy-to-use tools are recommended such as management tools and communication tools. The 2017 EWoS – which will take place all over Europe from the 23rd to the 30th of September - will be the occasion to mobilise the sport movement and to make people #BeActive.